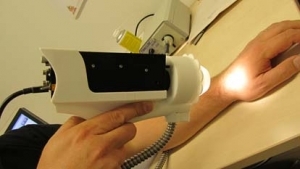 VTTA new hyperspectral camera developed by Finnish researchers is able to detect early stages of skin cancer in matter of seconds. A new innovative handheld camera developed by VTT Technical Research Centre of Finland is able to detect early stages of skin cancer in two seconds. The ultra-precision hyperspectral camera recognises early stages of skin cancer that are invisible to the naked eye. According to VTT, skin cancer rates have been growing exponentially, due to population ageing and UV damage caused by excessive exposure to sunlight. Researchers have run a pilot study using the hyperspectral camera, and the preliminary results of the study are promising. A pilot wsa done in collaboration the University of Jyväskylä, the Päijät-Häme Central Hospital and the Skin and Allergy Hospital of Helsinki University Central Hospital. The innovation has patents in the USA and in Finland, and Mr Heikki Saari, a principal scientist at VTT, is the inventor of the patented device. Finnish company MultiTouch says it has delivered the largest interactive display wall for research purposes in Europe at Technische Universität Dresden (TU Dresden). At about 5 metres wide and 2.5 metres high, the MultiTaction iWall recognises finger touches, complete hands, infrared pens and objects. TU Dresden is conducting research in human-computer interaction and will also use the wall for interactive visualisations. — We expect large interactive displays to be omnipresent in the future, says Professor Raimund Dachselt, head of the Interactive Media Lab at TU Dresden. — The MultiTaction iWall provides us a 25 megapixel display supporting the widest range of input methods and unlimited touch points. The MultiTaction technology is the only one worldwide to support this variety of interaction modalities at this size. That’s why we want to be the first lab with this equipment to do groundbreaking research in this area. TU Dresden and its Computer Science department have already started to use the wall for a range of research and student projects. MultiTaction technology was originally based on research made at the Aalto University / Helsinki Institute for Information Technology HIIT. The past years have not been easy on Europe, nor Finland. While the global economic juggernauts, the United States and China, are bordering between an economic upswing and normalizing economic development, Europe seems to be stuck in a rut. For Finland, European challenges do not bode well. Finland’s key export markets lie within the European Union. Furthermore, the close proximity to the Russian market offers only some support to Finnish economy, as Russian economists debate whether the country’s traditional sources for economic growth are of diminishing value. Luckily, Russian citizens visiting Finland during their holidays are still spending money in goods and services in record numbers. Besides the geography-related economic challenges, Finland is facing grave choices in how to best manage much-needed structural changes. These structural changes are required to cope with long-term trends such as demographics, Finnish baby-boomer population is aging in masses, and shorter-term changes such as the loss of international competitiveness in relation to Finland’s closest competitors e.g. Sweden. In short, Finland and its leaders have started to realize that the country’s past high performance in international rankings does not equal continued success when external conditions eventually improve. To avoid real stagnation in Finland, we must do two things right. First, to improve the country’s potential for economic growth with a wide array of actions, incentives and policies fostering growth. These include enhancing productivity with the smart, systematic digitalization of the economy in all sectors and improving the country’s capability to innovate and quickly commercialize inventions. Second, Finns must seriously contemplate that the era of solid growth is over and to adjust the society to the new realities. This does not have to mean throwing ash over ourselves, but to plan for the positive outcomes of less can be more, when done right. Finland’s past high performance in the above areas of adjustment, innovation and diffusion of technology is well-know and used as a text-book example of a former agrarian economy becoming a Nordic industrial success-case. To add to current complexity is that Finland is in the middle of a quagmire dominated by fast-moving external and internal changes. To survive, Finland must be prepared to make smart, sometimes drastic, choices, but most importantly fast action in making the choices is required to avoid real stagnation in economics and politics. Finnish Chambers of Commerce are well-positioned to list, suggest and prioritize what the smart choices should be as the Chambers are direct conduits to Finnish companies and have extensive international networks to understand global economic forces at play. From that background the Chambers can provide guidance to decision-makers what choices matter the most to Finland’s international competitiveness, how Finland can best benefit from its European surroundings and how to find the right balance between national strategic objectives and local actions. In the contemporary world, one size fits all is not necessarily the best option to achieve change, we must take into account that Finland as a nation consists of many varied areas with varied resources and demands. To the author this became blatantly clear when in 2013 I organized a nation-wide digitalization tour visiting 10 different cities and towns. In short, digitalization meant different things to 10 audiences gathered to understand what new technologies such as cloud computing and the Internet of Things can offer to them in the region and company-level.